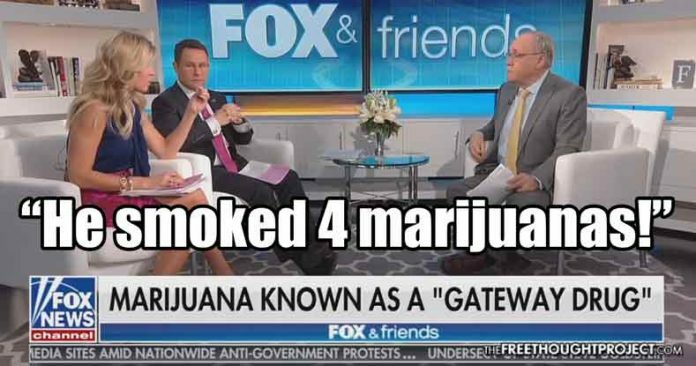 An "expert" took to Fox News this week to try to convince Americans that all the debunked myths on the "dangers" of marijuana are still a thing. Just as Jeff Sessions rescinded a pro-freedom and pro-states’ rights policy of allowing individual states to decide the legality of marijuana, FOX News aired a segment with their “medical expert” informing its viewers on the “dangers” of marijuana use. The outright propaganda and lies spewed by their so-called expert were hilarious while at the same time incredibly worrisome—because many people actually believe them. Fox News’ Medical ‘Expert’ and A-Team member, Dr. Marc Siegel went on a rant on how “regular marijuana use carries significant health risks.” Out of the gate, the “expert” falsely claimed that fatal car accidents involving pot have doubled since legalization. As TFTP reported at the time, a study published by the American Public Health Association found that states with legal medical cannabis have lower rates of traffic fatalities than states with full prohibition. The researchers analyzed 29 years of data in the Fatality Analysis Reporting System. This medical doctor then went on to say that because THC stays in your system for “days and days” after use that it still impairs your driving. Seriously. The myth that cannabis use kills brain cells has been heavily debunked by scientists over the years. The evidence is so overwhelming that even the US government has admitted that pot does not kill brain cells. Many critics still cite the notorious monkey studies of Dr. Robert G. Heath, which purported to find brain damage in three monkeys that had been heavily dosed with cannabis. This work was never replicated and has since been discredited by a pair of better controlled, much larger monkey studies, one by Dr. William Slikker of the National Center for Toxicological Research and the other by Charles Rebert and Gordon Pryor of SRI International. Neither found any evidence of physical alteration in the brains of monkeys exposed to daily doses of pot for up to a year. Human studies of heavy users in Jamaica and Costa Rica found no evidence of abnormalities in brain physiology. While pot doesn’t kill brain cells, as TFTP reported, it most certainly does kill cancer cells. After decades of claiming that cannabis has no medicinal value, the U.S. government admitted in 2015 that cannabis can kill cancer cells. Although still claiming, “there is not enough evidence to recommend that patients inhale or ingest cannabis as a treatment for cancer-related symptoms or side effects of cancer therapy,” the admission that “cannabis has been shown to kill cancer cells in the laboratory,” highlighted a rapidly changing perspective on medicinal cannabis treatments. In the most recent update to the National Cancer Institute’s (NCI) website included a listing of studies, which indicated anti-tumor effects of cannabis treatment. After lying about the physical effects of marijuana on the brain, the FOX News ‘experts’ went on to claim that marijuana use can “ruin your life,” with the talking head host spewing some nonsense about how someone at her high school tried pot and went on to become a loser. Why does marijuana ruin your life? Well, according to the FOX News medical expert, it’s a gateway drug. Again, this doctor is wrong. But when one looks past the surface of this claim, it becomes downright silly. It just so happens that 99% of these so-called illicit drug users could have also tried coffee, soft drinks, candy, or milk before moving on to harsher substances. As TFTP has reported, marijuana is actually an exit drug as the promise it shows in curbing opioid addiction as well as relieving symptoms of PTSD and depression far better than the dangerous pharmaceuticals is evidence of this. As TFTP reported, a JAMA Internal Medicine study looked at ten years of data in all 50 states, concluding that states with medical cannabis laws had significantly lower rates of opioid overdose mortality. Toward the end of the show, the host showed just how ridiculous their propaganda piece was by talking about having some bishop on who claimed to be addicted to marijuana. Listening to the host explain the addiction was outright hilarious. “He (the bishop) would smoke marijuana and he wouldn’t get a high off of it,” said the host before becoming the subject of one of the most hilarious anti-reefer madness memes to ever make it on to the internet. Sadly, it appears that Jeff Sessions is watching this same show and using it to make policy decisions that will affect millions of people by potentially stripping away their medicine or kidnapping, caging, and killing those who don’t obey. Below is an example of how blatant stupidity and ignorance can morph into an ‘educational series’ on marijuana.